Thanks to everyone who came out for our BERNINA open house on March 1. We had more than 70 people in attendance and it was a fun, upbeat day - despite the blustery weather. Congratulations to the winners of the door prizes that were given away that day . . . Barb Haynie, Josi Russell, Carolyn Ower, Cathy Korzan, Kelly Shethar, and Lou Ann Burkett. Join us for our regular Third Thursday Demo when Karen and Cindy will team up to demonstrate ideas to quilt small projects on your home machine. Don’t limit yourself to stitch-in-the-ditch. Branch out with some easy quilting techniques that you’ll be able to use on place mats, table runners, wall hangings, and small quilts. This event is free. Bring a friend and sew for the rest of the afternoon if you’d like. Bring a project you’d like to finish (or at least make progress on!) or start something new at Sewing Sunday. Light refreshments provided and this event is free. Just call to get you name on the list. Space is limited! 12:15 p.m. OR 5:15 p.m. Curious about learning to quilt? It’s not as difficult as it looks! Come to a FREE 45-minute demo session and see how easy it really is to measure, cut, and piece a quilt block together. You’ll learn many tips and tricks (one that will surprise you) about how to create a beautiful quilt. No RSVP necessary . . . just show up at Cortez Quilt Company, 40 West Main in Cortez at either 12:15 or 5:15 p.m. on Wednesday, April 2. Call 970-565-7541 for more information. 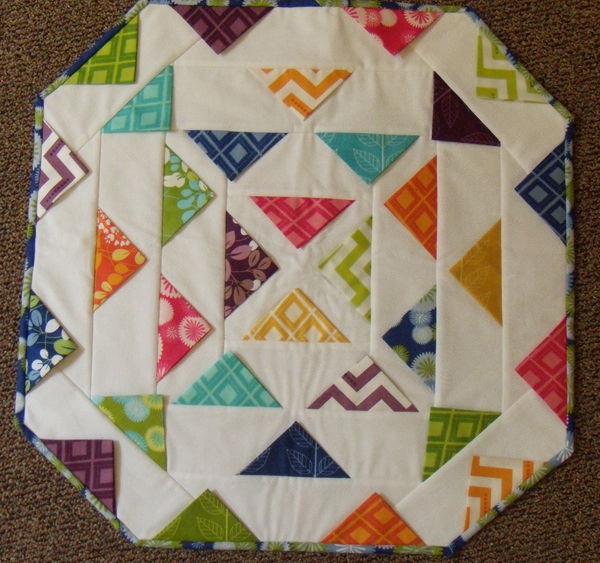 Do you have a friend who admires your beautiful quilts but says, “I could never do that!”? Here’s an opportunity to help your friend move beyond “I could never” to “I can do it.” Bring your friend on Saturday, April 5 for a day of fun and confidence-building. Karen will teach a mini-beginner class from 10 a.m. until 12 noon. Then you’ll support your friend in the afternoon (while you work on a project of your own) as she pieces a block and adds a border or two to create a pillow top, wall hanging, or table topper. The fee for this special event is $75 per friend pair. The fee includes lunch for both of you, fabric and thread for your friend to make her block, and a special gift for each of you at the end of the day. We can also provide a sewing machine for your friend if needed. Limited to four friend pairs. You know all that leftover fabric in your sewing room you’ve been meaning to organize? Well, this is your chance to get it done and have fun with other quilters and sewers at the same time. Cyndi Foote is the Queen of Scraps (that means she uses everything . . . eventually!). She’ll give a short presentation on fabric scrap control, then you’ll spend the rest of the day organizing your stash of leftovers. For this event we’ll have several new scrap quilt books in stock that will be 25% off for participants. This event is free, but limited to eight due to space. Call to sign up today! Relax at the end of the week with an evening of sewing and fun with old and new friends. Cyndi and Beth will host this fun event. It’s free, but space is limited so call today to get your name on the list. Bring a brown bag dinner or order something from one of the wonderful nearby restaurants. Beverages are provided. Space limited to 16, so sign up soon. We are very happy to do special orders for notions and, if it's a "basic," even fabric that you might need for a class, retreat, workshop, or project. By request, we've just ordered several of Kaye England's Cut for the Cure rulers. Those should be in stock by the end of the week. We can also now special order parts and accessories for most sewing machines. This adorable new quilt will make aperfect gift for any little girl of boy. Stop by the shop to see the sample. 40 x 48 inches. $55. #1: All of our fleece is 40% off . . . stock up now even if you don't use until next winter. #2: For the remainder of March, Best Press is 20% off! #3: During the entire month of April, BERNINA jeans foot #8 will be 25% off. BERNINA offers a foot promo each month and we plan to participate in most or all of them. Regular price is $32 . . . special price will be $24. Advance orders welcome! Upcoming classes . . . 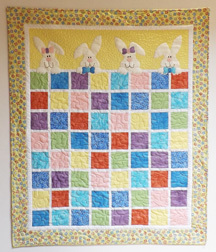 This cute table topper is a quilt-as-you-sew and once you make one you won’t want to stop. They are quick and make wonderful gifts. Use a charm pack to get lots of variety in the prairie point triangles against either a light background like the one shown here or a darker background. Stop by the shop to see a sample with a dark background . . . it’s a very different look! Class taught by Karen Childress. 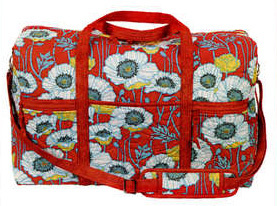 Functional yet stylish, this large duffle bag (21in L x 13in H x 8in D) carries everything you need for travel and still fits in the overhead bin. The full-zippered top allows easy access to all your gear. A comfortable padded adjustable carrying strap. This class will be taught by guest teacher Peggie Buckholts. Stop by the shop to see the sample . . . . it’s very nice! Click here to see more classes. We service and repair all models of BERNINA sewing machines in-house. We offer basic service (clean/oil/adjust) on other sewing machine brands as long as they are no longer under warranty. You may drop your machine off anytime we are open (Mon-Sat, 10-5). If you’d like to check on turnaround time before bringing your machine in please call us at 970-565-7541. Our usual turnaround time is 4-5 days, but that may vary a bit depending on how busy the service department is. If you are coming from out of town, please call to make special arrangements for same-day service. NOTE: Our certified technician, Bill Grimm, will not be working March 31 - April 4. If you're planning to bring a machine in for service or repair, please make a note of this. News flash . . . the BERNINA 880 Sewing and Embroidery Machine has arrived. We jokingly say it does everything but your income taxes. Seriously, with this machine you thread your needle by pressing a button. The presser foot automatically lowers at the start of a seam and lifts again at the end. The feed dog raises and lowers automatically for free-motion stitching and embroidery. And there is a full 12 inches of space to the right of the needle. Don't need a machine quite this fancy? No problem . . . we have BERNINAs in all price ranges. Stop by for a demo soon. Ask us about 0% interest financing on BERNINA sewing machines! Did you know that you can receive product updates, get project ideas, and participate in free webinars directly through BERNINA? You can. Click here to sign up!